The present tense of regret is indecision. Hello! My name is Domenica Holmes, and I'm proud to be serving Rockdale, Newton, and the surrounding counties at the Conyers Music & Arts! 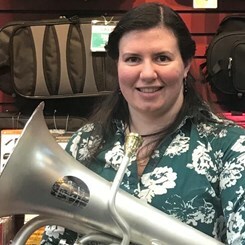 My primary instruments are euphonium and trombone; I play on a Besson Imperial and a Conn 88H, respectively, as well as a Bach 50B3L bass trombone. I earned my BA in Music Education from Montclair State University in NJ, where I studied with Dr. Mary Ann Craig. I also served in the 77th United States Army Band at Fort Sill, OK. I'm a classical music nerd through and through, but I'm also a huge fan of bands like Shinedown, Godsmack, Bon Jovi, and AC/DC. Ask me about my favorite movie and video game scores, too! I joined the Music & Arts team in July 2014, and worked at our Manalapan and Toms River locations in New Jersey before moving here in August 2018. I'm so excited to be here, and I can't wait to see you!